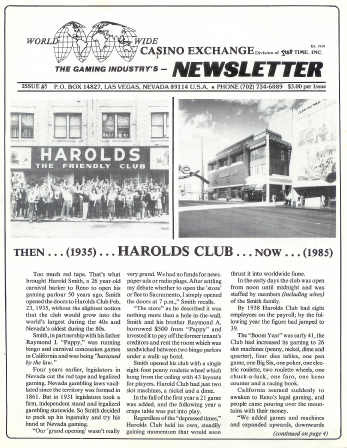 A few of you may vaguely remember this item – a 1985 issue of Bill Borland’s World Wide Casino Exchange Newsletter that featured a story on Harold’s Club. Bill started a company he called Star Time, Inc. from his offices in Las Vegas and began purchasing casino dice, chips, and other memorabilia in the late 1970s. He and his best girl, Starr Warrick, put out a semi-regular flyer with new chips they had come across, and they weren’t dealing in a handful of chips, no, they bought tens of thousands of chips, often getting all denominations from closed casinos at just a nickel each. As their business grew, Bill took to selling racks of chips (such as a rack of $5 coin-inlay’s from the Rendezvous Casino in Vegas for $79). At the time, I was dealing in small lots, purchasing most of my chips from ads I ran in local newspapers around Reno and Sparks. When I was offered a box of 2500 chips from Zimba’s in Reno, I figured I would have enough traders to last a lifetime. So, I called Bill and asked about making a deal to trade for some of his least popular chips, figuring I would off about a thousand and be set. However, Bill’s way of doing business was to drive the kind of bargain where he was getting three or even four chips for every chip he was trading. Eventually, I sold about 2000 of the chips to a friend in Florida for his home poker games. To my knowledge, in over 20 years they haven’t surfaced as a “new” find of collectibles. Someday, they will. As for Bill’s “Newsletter,” he periodically sent out others, but I don’t recall a real timetable, although it was listed as a “bimonthly.” Phil Jensen was the Contributing Editor, and may have provided the stories, such as the one about Harolds Club in the edition above. What say you, Phil, was there any time table? Earlier issues had photos of Harrah’s in Reno, and from Las Vegas were covers with the Gold Strike Inn, Diamond Jim’s Nevada Club, and the Flamingo. Whether Bill Borland was timely or not, he provided a fun little newsletter that featured his gaming items and stimulated growth in the chip collecting hobby, and like other chip collectors and writers such as Jim Gillette, really helped promote the fun of casino history. I suppose a simple “Thanks” is due. Great job, I appreciate your idea of view for your professionalism, and I wish you a good day the pleasure of reading your future articles.Thanks.